Welcome to the Percussion Studio at the University of Tennessee at Martin. On this site you can find important information regarding events, audition requirements, video recordings, scholarship opportunities, and more. Here at UT Martin, our single mission is student success, preparing students with the skills they need to move to their next level in life. For some, that step means securing a music teaching position. For others, it may mean moving on to a top graduate school or a vocational career in the music industry. At UTM, we get you ready to do it all! We never want you to JUST SAY NO to that special gig or teaching opportunity. UTM students become skilled in literature on snare drum, marimba, vibraphone, timpani, multiple percussion, drum set, accessories, and electronic instruments, as well as a gamut of world percussion styles. Individual studio instruction has a “total” percussion approach and is supported by large and small ensemble experiences that, in addition to traditional and contemporary percussion repertoire, include styles through the Steel band, Brazilian ensemble, African ensemble, Afro-Cuban groups and more. The UTM Percussion Studio will provide professional-level experiences and opportunities for all students that will foster growth through self-discipline, creativity, and entrepreneurship. Successful students will embrace these challenges as they develop a global awareness toward their instrument and their fellow man, guiding them towards a passion for life-long learning that will in turn, lead to a rewarding career. The University of Tennessee at Martin Percussion Studio started in 1967 under the direction of Professor Nancy Matheson who directed the studio until 2005 when Dr. Julie Hill, alumnus of the UTM Percussion Studio, took over as Director of Percussion. In 2017, Dr. Hill accepted the position of Chair of the Department of Music and Dr. Shane Jones became and is currently the Director of Percussion at UT Martin. 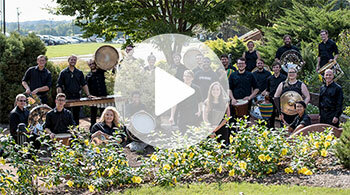 The UTM Percussion Ensemble has performed internationally at the Universidade Federal (UFBA) in Salvador de Bahia, Brazil, the Universidade Federal (UFPE) and Conservatório Pernambucano de Música in Recife, Brazil, and the PercuSonidos International Percussion Festival in Tampico, Mexico. The group has also performed at the Percussive Arts Society International Convention as winners of the 2016 World Percussion Competition and regionally, with annual performances at the Discovery Park of America and frequent appearances at the Tennessee Music Educators Conference and Tennessee Day of Percussion. Dedicated to community engagement, the UTM Percussion Studio provides regular educational clinics and concert opportunities to our community, including the “Roots of Rhythm” presentations, reaching over 6,000 students and community members annually. The UTM Percussion Studio collaborates with world renowned artists each year. Past guests include Michael Burritt, So Percussion, The Percussion Collective, Robert Van Sice, Liam Teague, X4 Percussion, Caixa Trio, B. Michael Williams, N. Scott Robinson, Scott Kettner, Brian Rice, Anders Astrand, James Campbell, Michael Gould, Miles Osland, Steve Houghton, and many more. The UT Martin Percussion Ensemble is active in promoting new works for percussion, including involvement in a number of commissions and consortiums with composers such as Adam Silverman, Steven Snowden, Cayenna Ponchione, Ivan Trevino, John Psathas, Halim El-Dahb, Gary Gibson, and Mark Zanter among others. The ensemble is currently under the direction of Dr. Shane Jones. If your name isn't listed below, it's an oversight. I need your help in adding to the database. Please help fill in the gaps and let us know where you are. Thanks! Married to Bethany Cooper and has one son, Reed. 1999-'00' Madison Scouts Drum and Bugle Corp. Adjunct Instructor of Percussion, Lee and Southern Adventist Universities. Phi Mu Alpha Sinfonia Alum. Minister of Music and Education at Union Valley Baptist Church, Beebe, Arkansas. Married to Tanya Price (UTM grad). Band Director, Portland West Middle School/Assistant Director, Portland High School in Portland, TN. Staff percussion arranger for Arrangers' Publishing Company. Board of Directors, Music City Legend, Inc. and Southeastern Color Guard Circuit. I'm married to Dawn Reed(formerly Simmons, UTM grad), and we have two boys, Wyatt and Jonah. Currently working as a translator and interpreter for the City of Nagoya, Aichi, Japan.